This machine is suitable for small-medium producer s of still liquid as WINE, oil, water, spirits, fruit juices, vinegars, etc. .. !!! IMPORTANT !!! Equipment specially designed for the sort of customer who requires several changes in format as the operations of variation are very fast and very cheap (change disc and stainless steel guides). Therefore it’s also suited for the production of small batches at low cost. !!! IMPORTANT !!! To guarantee a high quality level of the process RTA600-5 is equipped as standard with a insufflation system of antioxidant gas (Nitrogen)PRE filling (optional) and PRE capping (standard). !!! IMPORTANT !!! The supply system happens by gravity directly from the storage tank or from a buffer tank placed between the tank and the machine. After the filling, the nitrogen cleans the filling head in order to dry perfectly the bottle. Automatic plant closure caps with thermal head and automatic dispenser for capsules (trogh canal). 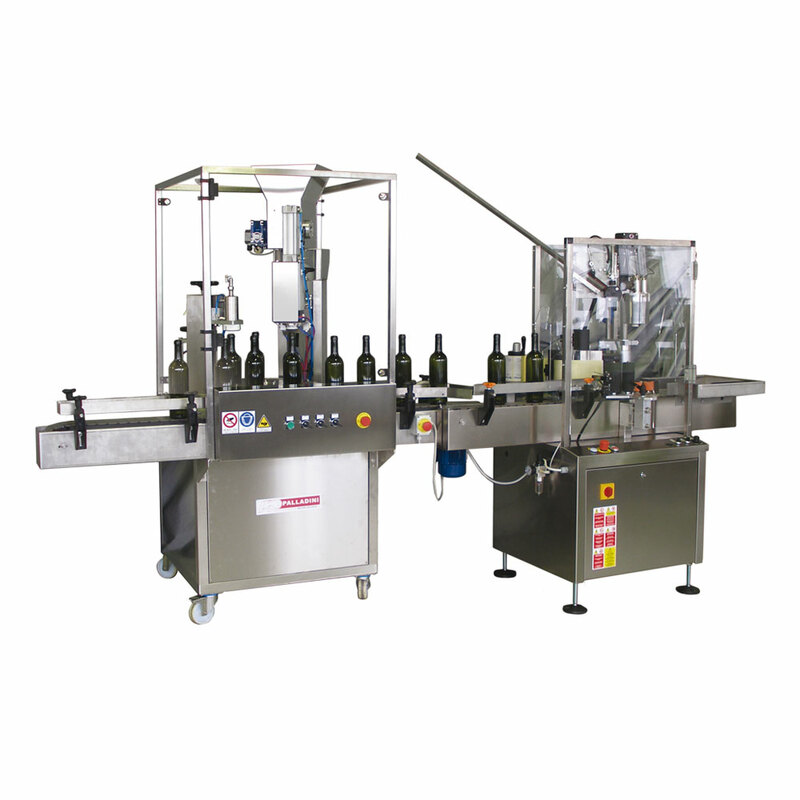 Labeling machine in stainless steel satin suitable for applying front/back label from the same roll on round bottle and conveyor belt for loading and unloading bottles. 2. Bottles blowing and cleaning system with air or nitrogen or filtered air with 2 spouts manually drived applied as appendix on the left side. Equipped with stainless steel AISI 304 basin and structure Manual operation of the water and blowing air or nitrogen. Air consumption: 300 lt / min. Filling System: Volumetric with atmospheric pressure. No isobaric.